We’d love your help. Let us know what’s wrong with this preview of Algorithmic Puzzles by Anany V. Levitin. While many think of algorithms as specific to computer science, at its core algorithmic thinking is defined by the use of analytical logic to solve problems. This logic extends far beyond the realm of computer science and into the wide and entertaining world of puzzles. 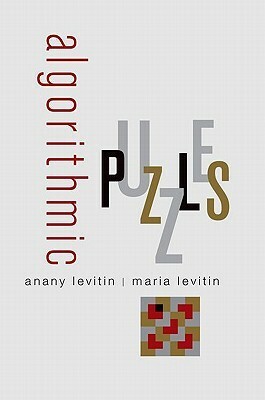 In Algorithmic Puzzles, Anany and Maria Levitin use many classic brainteasers as well as newer examples While many think of algorithms as specific to computer science, at its core algorithmic thinking is defined by the use of analytical logic to solve problems. This logic extends far beyond the realm of computer science and into the wide and entertaining world of puzzles. In Algorithmic Puzzles, Anany and Maria Levitin use many classic brainteasers as well as newer examples from job interviews with major corporations to show readers how to apply analytical thinking to solve puzzles requiring well-defined procedures. The book's unique collection of puzzles is supplemented with carefully developed tutorials on algorithm design strategies and analysis techniques intended to walk the reader step-by-step through the various approaches to algorithmic problem solving. Mastery of these strategies--exhaustive search, backtracking, and divide-and-conquer, among others--will aid the reader in solving not only the puzzles contained in this book, but also others encountered in interviews, puzzle collections, and throughout everyday life. Each of the 150 puzzles contains hints and solutions, along with commentary on the puzzle's origins and solution methods. The only book of its kind, Algorithmic Puzzles houses puzzles for all skill levels. Readers with only middle school mathematics will develop their algorithmic problem-solving skills through puzzles at the elementary level, while seasoned puzzle solvers will enjoy the challenge of thinking through more difficult puzzles. To ask other readers questions about Algorithmic Puzzles, please sign up. My first puzzle book. It has been an interesting read. The solutions are clear and detailed. Molti problemi matematici possono anche essere considerati "problemi informatici". In definitiva, risolvere il problema significa trovare un algoritmo tale che anche lo stupido computer possa risolverlo. In questo libro ci sono per l'appunto centocinquanta problemi di questo tipo. Gli autori in un certo senso barano, perché a volte ci sono anche dimostrazioni di impossibilità in alcuni casi e quelle non sono certo algoritmiche; ma non importa. Quello che importa è che ci sono i problemi, ci sono Molti problemi matematici possono anche essere considerati "problemi informatici". In definitiva, risolvere il problema significa trovare un algoritmo tale che anche lo stupido computer possa risolverlo. In questo libro ci sono per l'appunto centocinquanta problemi di questo tipo. Gli autori in un certo senso barano, perché a volte ci sono anche dimostrazioni di impossibilità in alcuni casi e quelle non sono certo algoritmiche; ma non importa. Quello che importa è che ci sono i problemi, ci sono le soluzioni, ci sono le spiegazioni delle tecniche adottate per risolverli (mi ero dimenticato: la prima sezione del libro contiene un tutorial con alcuni problemi risolti e l'elenco di tecniche classiche per risolvere questi problemi, dal divide-et-impera al togli-uno). Il tutto con un taglio più informatico che strettamente matematico, il che forse potrebbe risultare più interessante per alcuni. Tutti i problemi hanno sempre una spiegazione che rimanda alle tecniche usate nella loro risoluzione, oltre che - per quanto possa essere possibile in un campo come quello dei giochi matematici in cui spesso ci si passavano le cose in maniera carbonara - l'indicazione di dove il problema è stato presentato per la prima volta, magari in forma leggermente diversa. This is essentially a collection of puzzles. Algorithmic puzzles that have a defined procedure for solving problems. I loved that it wasn't written like a textbook yet for an amateur. It has a short tutorial section and the rest are problems to solve. Not going to lie, the problems are very challenging (even the easy ones). This review has been hidden because it contains spoilers. To view it, click here. Many interesting puzzles with good explanations in places (the tutorials at the start are the strongest point), but unfortunately spoiled by the inclusion of numerous puzzles where the solutions reduce to tedious symbol-pushing with little or no insight. A very entertaining book which exercises your algorithmic thinking muscles. If you like puzzles, and you like programming or algorithms, get this book!